Burger and sandwiches are perfect finger foods! No need for utensils to enjoy these beauties. 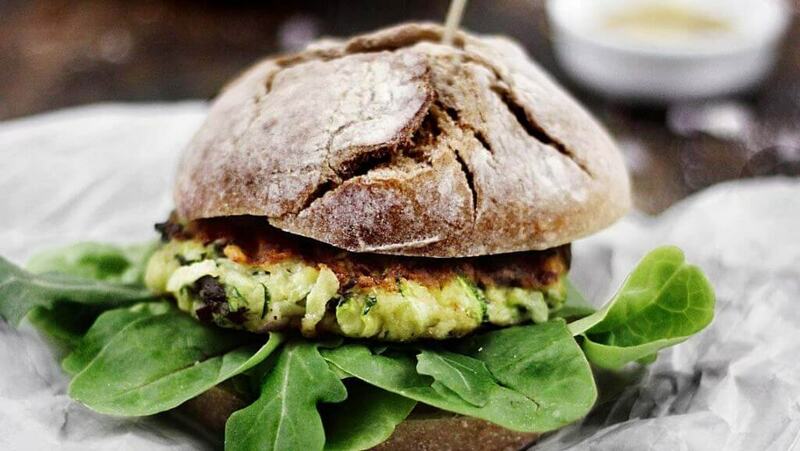 We have put together a selection of the five best vegetarian sandwich and burger recipes for you to make in under 30 minutes! These recipes were created by top food bloggers, and recreated by us in the KptnCook kitchen. Enjoy! Wash spinach and allow to boil for approx. 3 min. Place spinach and zucchini on paper towel and press out water. Mix spinach, zucchini, one half of onions, garlic, cheese, almond flour, egg, and chili flakes in a bowl; season with salt and pepper. Form patties approx. 1/2″ thick with the spinach-zucchini-mixture. Heat oil in grill or frying pan; fry patties for approx. 3 min. on each side. In the meantime, wash greens and let dry. To make the sauce: mix mustard, honey and remaining onions. Cut buns in half, top with sauce, greens and patties and serve. Peel and cut the yams and cook them for 10 min. Trim the sprig of rosemary. Halve the avocado, remove the pit and cut the flesh into slices. Squeeze out the excess water of the tofu with a paper towel. Crumble the tofu with your hands into a bowl. Add the cooked sweet potato to the bowl. With a fork, mash them together. Add the garlic, rosemary, red pepper flakes, sesame seeds and breadcrumbs and season to taste with salt and pepper. Mix until combined. Heat a pan over medium heat and add the olive oil. Fry the patties for a few minutes on each side until browned. 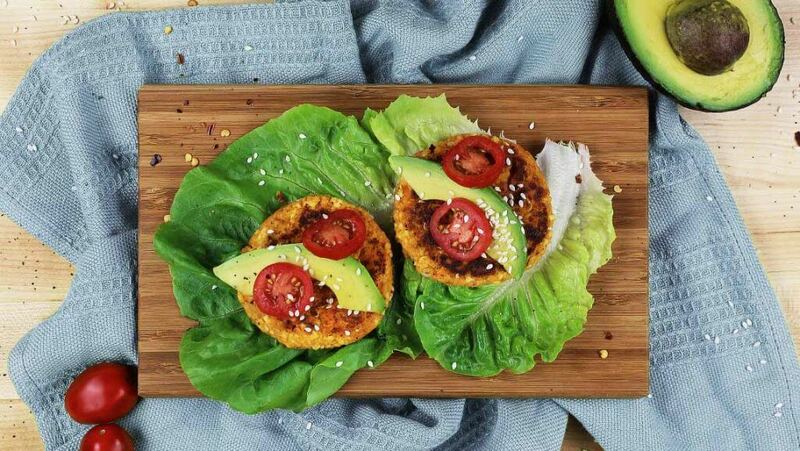 Serve in lettuce wraps and top with the avocado and tomato slices. Heat oven to 390°F (200°C). Wash bell pepper, cut in half and remove seeds. Place on lined baking tray. Roast in oven for 20 min. with the cutting side down until the skin blisters and turns black. Meanwhile, slice tofu. Pat dry and toss in flour. Heat olive oil in a pan and fry tofu on both sides until crispy. Remove bell pepper from oven and place in a plastic bag. Close and place bag in cold water to cool. Now you can remove the skin easily. Blend bell pepper, pepperoni, garlic, almonds and thyme. Add olive oil as needed and season to taste with salt and pepper. 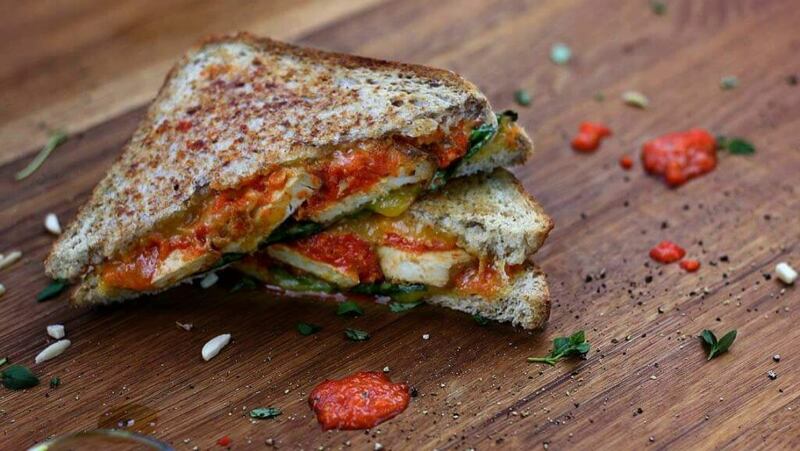 Top bread with cheese, spread with bell pepper sauce and tofu. Place bread with toppings in a hot pan with some olive oil. Add cheese and greens and place second slice of bread on top. Press together and fry on medium to low heat. Fry on both sides until golden brown, cut into half and enjoy! Heat balsamic vinegar in a pot and cook until it starts to thicken. Bake slices of bread in the oven until crispy. Add plums to balsamic vinegar and marinate for a few minutes. Slice goat cheese and place on the bread. 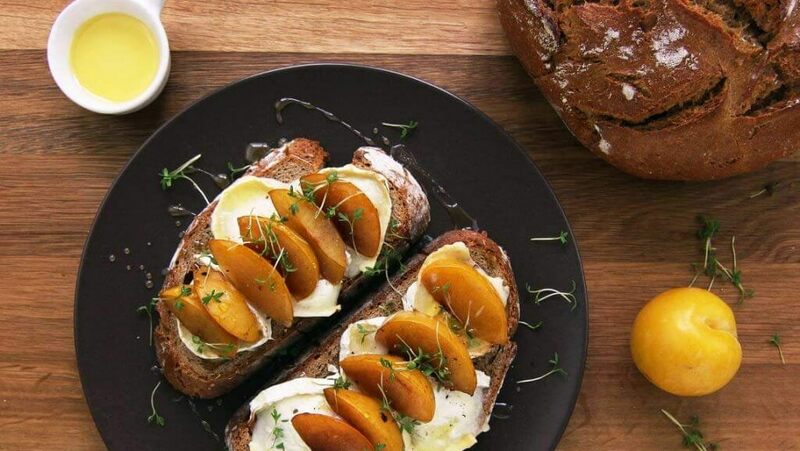 Top goat cheese with plum slices. Place bread under the grill until goat cheese has slightly melted and is golden brown. Drizzle with honey and top with clover sprouts. Squeeze out lemon juice (1/2 tbsp each). Cut avocado in half, stone, and scoop out the flesh. Mash avocado, oil, lemon juice, and cayenne pepper with a fork and mix together well. 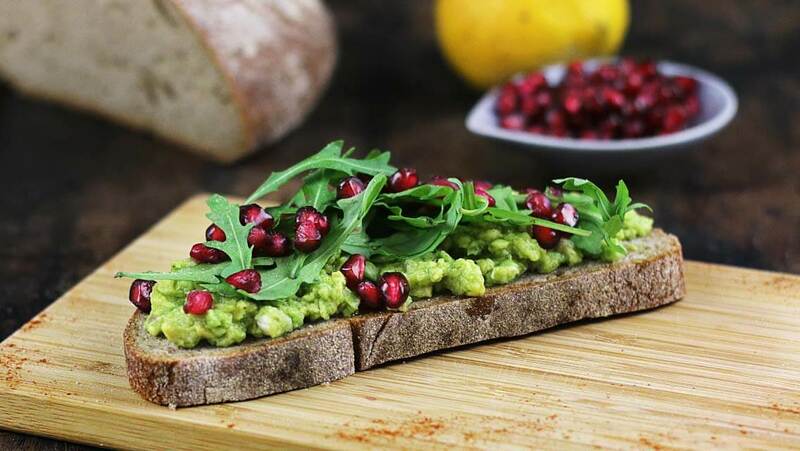 Spread the bread with guacamole and top with arugula and pomegranate seeds. You can find more amazing finger foods in our free KptnCook app. Posted in Rezepte and tagged cooking, DIY, food, food blo, food blogger, foodie, recipe, soups, summer recipes, vegetarian. Bookmark the permalink.